Looking forward to rockin’ and rollin next Friday January 25th at the classic Yost Theatre in Santa Ana with Gretsch afficionados Jason Lee and the R.I.P. Tides, Chris Cosello and Tammi Savoy, Jamie James and the Kingbees and The Rockin’ Rebels! 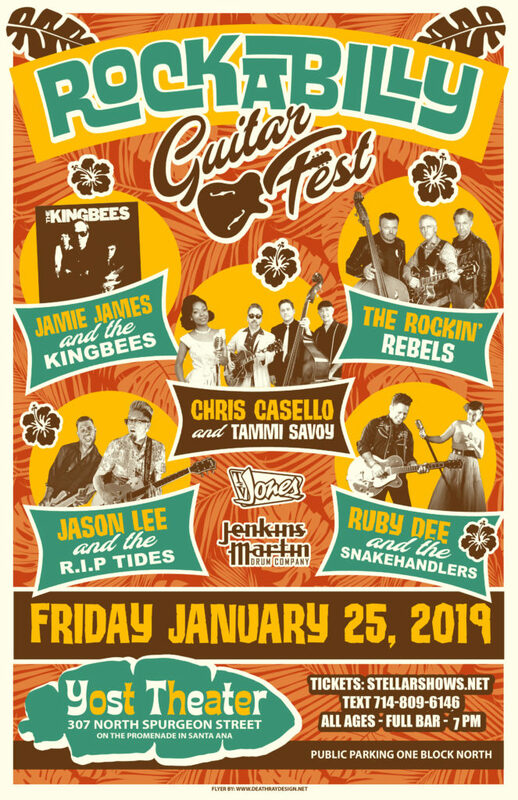 Get yer tickets here Rockabilly Guitar Fest and we’ll see you there for an incredible night of surf, rockabilly, R&B and jump blues! Did I mention we Can. Not. Wait! This entry was posted in Random Randomness, Tour Dates and tagged chris cosello, Jamie James and the Kingbees, jason lee & the R.I.P. Tides, jump blues, R&B, rockabilly, ruby dee and the snakehandlers, Tammi Savoy, western swing music. Bookmark the permalink.